The cayenne pepper is a member of the Capsicum family of vegetables, which are more commonly known as chili peppers. It is known botanically as Capsicum annuum. The common name "cayenne" was actually given to this pepper because of its cultivation in a town that bears the same name in French Guiana on the northeast coast of South America. It is not surprising that cayenne peppers as well as other chili peppers can trace their seven thousand year history to Central and South America, regions whose cuisines are renowned for their hot and spicy flavors. They have been cultivated in these regions for more than seven thousand years, first as a decorative item and later as a foodstuff and medicine. It was not until the 15th and 16th centuries that cayenne and other chili peppers were introduced to the rest of the world. Christopher Columbus encountered them on his explorations of the Caribbean Islands and brought them back to Europe where they were used as a substitute for black pepper, which was very expensive at that time since it had to be imported from Asia. Ferdinand Magellan is credited with introducing them into Africa and Asia, continents that since have incorporated them not only into their cuisines but their pharmacopeias. While cayenne and chili peppers are now grown on all continents, today China, Turkey, Nigeria, Spain and Mexico are among the largest commercial producers. Cut eggs in half. Remove yolk and add to a bowl. Using a fork, mash yolk. Stir in light mayo, salt, pepper, paprika and cayenne. Stir well. Fill egg whites with yolk mixture. Place eggs in a container, cover and chill until ready to serve. Enjoy! Try using curry powder in them next time. It's really good! Mmmmmmm, nom-nom-nom. I love me some spicy deviled eggs! A sure success! Great Appetizer! Merry Christmas! It look great and nice. Wishing you a blessed Christmas and Happy New Year. Cayenne is h.o.t! 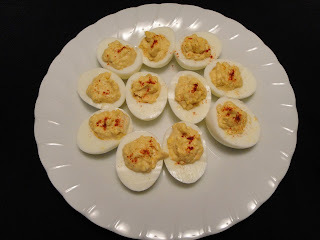 I love just a tiny bit....and pretty much anything on deviled eggs! Thank you for all the warm comments. You guys are the best.